Manu Prakash, an IIT Kanpur and MIT alumnus, runs a Biophysics lab at Stanford that is particularly interested in a branch of organisms called 'basal metazoans', which include creatures like sponges. If disease pathogens can be made visible on the field, as in the Ebola outbreak, then health workers would be aided in their work. But imaging equipment is often bulky and expensive, almost impossible to take out [if] there in an emergency situation. Then, there is the threat of contamination from samples to the equipment. 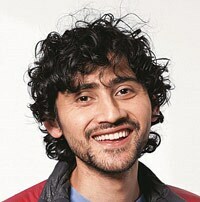 Manu Prakash from Stanford University is refining the process of printing the polymer optics. A radical approach is to have a disposable and handy microscope which can literally be incinerated after use. Such an approach is a possibility because of the work done at a Stanford lab, which used techniques of origami and roll-to-roll manufacturing to create a microscope which can go up till 2100x resolution and costs less than a dollar in parts to assemble. 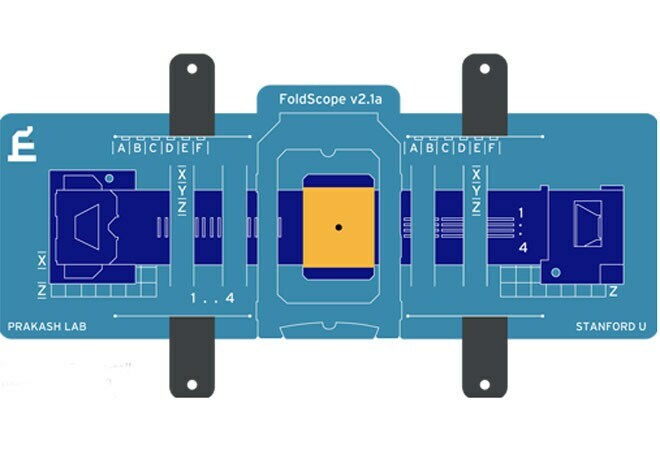 Called Foldscope, it can be cut out of paper and fitted together with small lenses, batteries and an LED to a make bookmark-sized microscope. Field trials have been on for several months to tweak its efficiency and as an outreach project. Manu Prakash, an IIT Kanpur and MIT alumnus, runs a Biophysics lab at Stanford that is particularly interested in a branch of organisms called 'basal metazoans', which include creatures like sponges. As Prakash says in an online video, he wanted to democratise access to this world of microorganisms the way astronomy is now open to DIY hobbyists. The idea was that science can be about asking questions and simply looking with the help of available equipment, which did not have to be expensive. Strains connecting the work were principles of origami - which had found applications in everything, from space telescopes to making robots - and were useful in manufacturing because of their ability to make 3D structures out of 2D sheets. James Cybulski, Prakash's graduate student, tinkered and made these strains come together in an efficient manner. Roll-to-roll manufacturing processes, used in making matchboxes, could make for assembly units of even a billion possible. The microscope is assembled in three layers, and these can be modified to provide several different types of imaging. In one assembly, there is the ability to project the image on a wall. The first is a sample holding layer, where a normal slide can fit in. The second is the optics layer and finally, the illumination or light source layer. Small modules - like paper jigsaw puzzle pieces with the cheaper optics printed in the middle - can be inserted into the folds of the origami assembly. The process uses origami to ensure that the optics align. All the parts can be cut out of a single sheet of paper. 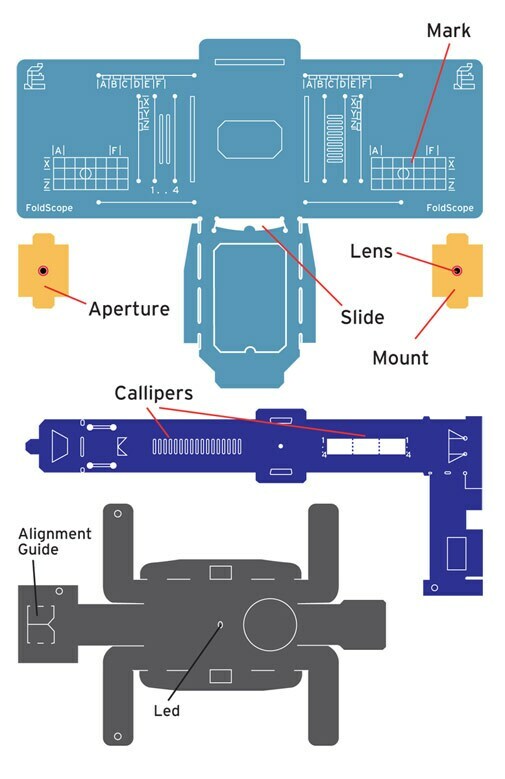 When assembled together, it works as a functional microscope. Once the sample slide is put in, a layer at the top moves left or right to change the field of view while tension in the fingers can make it move up or down to focus. A high point was showcasing the assembly at a Maker Faire hosted by the White House in June. The director of the US National Institutes of Health, Francis Collins, who was at the Faire, featured an entire post on his blog on it. Prakash has also been on the lecture circuit, including TED and others. In terms of funding, last year the Foldscope received about $750,000 in grants over three years from the Gordon and Betty Moore Foundation. In an online video, Prakash says he was inspired by a photograph of Mahatma Gandhi peering through a microscope when he visited Sevagram years ago, to look at the intersection of science and society. A diagnostic toolkit that can latch out from a mobile phone has been created by researchers in Berkeley, a company called CellScope has been spun out. There are other ways to rig mobile phones and get their images to higher magnifications. 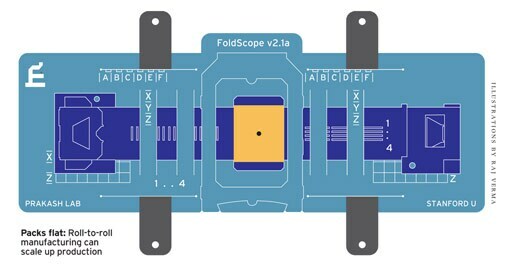 The Foldscope can also be coupled to an iPhone, according to the PloS paper. The Prakash Lab is doing work with microfluidics as well, a research area touched upon last issue. This work, done with his graduate student George Kotir, uses punch cards tapes, originally used in computers to control chemical reactions in microfluidic chambers, a kind of programmable chemistry.